With the PGA Tour season resuming on Friday on Hawaii at the Hyundai Tournament of Champions, a lot of golf fans are going to be tuning in to see the surrounding scenery of the winners-only tournament. Kapalua's Plantation Course can be sensory overload for players and fans, who are treated to everything that makes Hawaii such a special place. 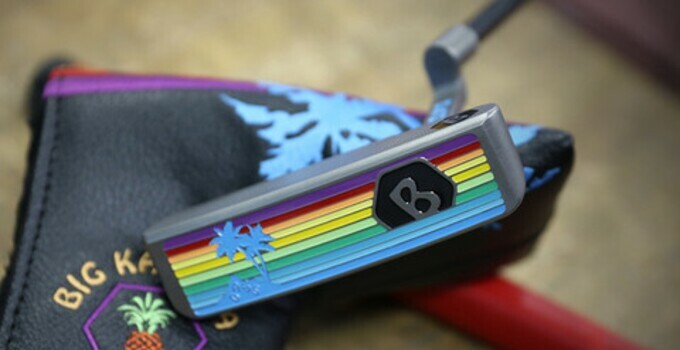 The folks at Bettinardi Golf tried to capture the beauty of the Aloha State with a new limited edition release of what the company calls the BB Zero Big Kahuna Aloha DASS (double-aged stainless steel) putters. The treatment of steel makes the putter unique, according to Golfweek. Using this technique, raw stainless steel is softened by heating it to 600 degrees, then left to cool in open air. It’s then reheated a second time, to 275 degrees, and again allowed to cool. The result? Bettinardi says the putter feels softer. The Hawaiian influence is the retro-style graphics on the blade, as well the delightful head cover. Just a dozen of these putters were made, and they're priced accordingly: $1,750 will get you one.